It's something old, something new, as Justin Timberlake and Macklemore & Ryan Lewis lead the 2013 MTV EMA nominations with five nods each. 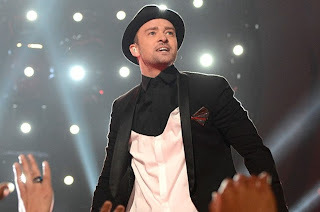 Timberlake proves he's still got what it takes after his long hiatus from music, with nominations in the best male artist, best live, best look, best U.S. act and best video categories. Breakthrough duo Macklemore & Ryan Lewis will compete for the best new artist, best hip hop, best song, best U.S. act and best world stage prizes in the nominations announced Tuesday. Following in their wake are four solo superstars - Lady Gaga, Justin Bieber, Miley Cyrus and Robin Thicke - who are all up for four awards. The 2013 MTV EMAs will be held at Amsterdam's Ziggo Dome on Nov. 10.